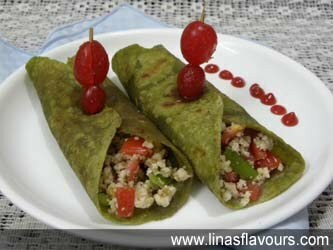 To make Spinach Wraps – Take spinach, add ¼ glass of water and blend it to make puree. Take a bowl, add wheat flour, spinach puree, ginger-green chillies paste, oil, salt, pepper and knead soft dough. Add water if needed. Make small balls and roll it about 4-5 inch diameter wraps. Take tawa/griddle and cook on both the sides smearing with oil. To make stuffing – Take a pan and heat butter. Add bell peppers, salt, black pepper and sauté it for 1-2 minutes. Add finely chopped tomatoes, cottage cheese, cheese, mix it and switch off the heat. Take one wrap. Put the stuffing in the centre and fold it from both the sides. You can apply tomato ketchup on the wrap if you like it. Close it with cherries inserted toothpick.